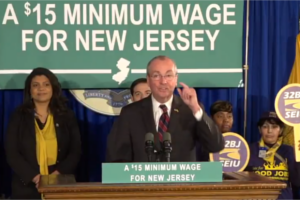 Democratic leaders delivered a compromise on the controversial proposal to increase New Jersey’s minimum wage to $15 an hour. According to their announcement, the base minimum wage for New Jersey workers would increase to $10/hour on July 1, 2019. By Jan. 1, 2020, the statewide minimum wage would increase to $11/hour, and then would increase by $1/hour every Jan. 1 until it reaches $15/hour on Jan. 1, 2024. Several categories of workers will reach the $15 an hour wage later. Seasonal workers and employees at small businesses of five workers or less would reach $15/hour by Jan. 1, 2026. Read the leaders’ full statement here. NJBIA’s President and CEO Michele Siekerka responded: “Today’s announcement is another hit to small businesses who are absorbing cumulative costs in the form of new mandates, more subsidies for energy delivery and increased taxes as a means to balance the state budget. Read Siekerka’s full statement here. The more mandates he puts into place, the worse it is for the taxpayer in New Jersey. No new companies will choose this State. We employ a substantial amount of people in NJ and I can honestly say we constantly look for way to move manufacturing out of the state. We certainly do not invest in our facilities in NJ the way we used to. So they will kill off small businesses more slowly than they originally had planned. Sweeney will say “business owners were going to complain no matter what, they always complain” That is easy to say when you are not the one that has to find a way to pay for this. Will the last business owner in NJ please turn out the lights on the way out. Common sense proposal for any politician. Garners votes and costs them nothing. What the hell do they know about running businesses and controlling costs? The answer is obvious, absolutely nothing. Is it any wonder why there are kiosks popping up at every fast food restaurant, were you can order and pay for your meals? How about the Amazon warehouses that are opening all over the state? All robotics. There will be a noticeable increase in the number of unemployed and part time workers in this state by the end of next year. I’m curious how you handle say an employee with a degree and a few years say making $17 an hour, now you have a non-degree new employee coming in at $15? I would think people would then want a wider wage gap. Also is someone is doing labor intense job for a few dollars more companies might lose people to an easier job at $15. NJ was affordable with much lower minimum wage. When politicians didn’t tax us to death and let entitlements and legacy pay get so high. All for fair pay, pension, and benefits. I own a small business that will not be hiring any more entry level employees, $15/hour is just too much money for us to afford. Thank you Governor for making us choose between making a profit and hiring new employees. This is just dumb. I was looking for a job recently after having been laid off after 20 years on the job. At the time of the layoff I was making $25 an hour. It was difficult to find any job approaching $25 hourly. Most jobs for my skills (administrative and technical writing) were around $15 to $17 dollars an hour. My husband owns a small business, and we are being taxes and regulated as well as hit with fines, fees, and mandates. It’s out of control. Large and small businesses will leave NJ in droves, right along with NJ citizens. We plan to be among them. Will NJ Income tax be zero on 15.00 per hour…….? My sons will inherit our business and are already considering a move to PA or shutting down completely. Trenton is killing us. In business since 1960. Used to be 27 employees now down to 18 and reaching further bottom rungs! They don’t care about us!! Socialist policies at their finest. Wait until they see the unions jack up their rates to construct the schools, roads, and other infrastructures in New Jersey. Sweeney doesn’t care because he is an iron worker. More wages in his pockets. Why would you be having kids when you can’t afford them. Minimum wage positions are not supposed to be career positions. Why is $15 fair in NJ? The cost of living here is high; property taxes are high, gas tax has skyrocketed (there is your tank of gas), income tax is high, sales tax is high & Murphy wants to put that back to 7%. Instead of real attention to our very high cost of living, they push the blame of a “living wage”. The shame belongs to politicians and those who keep them in power. Dear melvin who thinks this is a good idea. Quick economics lesson: if a tomato now costs $1… if you Double the the cost to plant , harvest, ship to store stock on shelves, and check out at the store. The same tomato will now cost $2… so the minumum wage person now makes more but cannot buy anymore products… it only cuts retired people on a fixed incomes buying power in half. Here comes inflation.. i hope your income will also double by 2024 so you can afford the same amount of stuff. Entry level positions are starting positions – not meant to support a family – if you want to support a family learn a trade or seek further education to move up the ladder. Kids working at McDonalds will not have jobs – they are already being replaced with kiosks – have you been to the airport lately? No employees – just a bunch of kiosks at the tables to order your food and pay with a credit card – no jobs. Government should not dictate how much employees are paid. This is a direct move towards socialism. We are small manufacturing company of 7 people. The 4 people who currently make $11/hr will be eligible for added $4/hr x 4= $16 x 2000 hrs = $32000 additional out of my pocket + workers comp and taxes. My income last year was $85,000 . Have some politician do the rest of the math for me! We compete with China and Mexico already. We can’t pass along increases to our customers. The market should be determining labor rates not Trenton. The world economy we live in is not set up to guarantee a person making $10 or even $15/HR can support a household in N.J..
Would have been a lot better if companies with fewer than say 25 employees were exempt. Gov talks about working full time and living in poverty. Nobody working min wage should be thinking about supporting a family; it’s supposed to be entry level – low or no skill. First rung on the ladder. This is not a plan for personal or financial success. If Dems would agree to control the border the marketplace would better deal with these issues. Well Ollie, they did it again! Just a few days ago Senate President Sweeney was aghast that, oh my, our decifict will reach $2 Billion dollars by 2020 and DOUBLE to $4 Billion by 2023 – and that’s just for State employee pensions and benefits. Senate President Sweeney said we need to be fiscally responsible (Yeah, it was that damn Joe Taxpayer’s fault) and attack this problem. So Sweeney suggested that we raise the State income tax by 25% and raise the sales tax to one of, if not the highest in the Nation. Then, Govamanure Murphy and Senate President Sweeney just think it is a dandy idea to add to the burden of NJ small business and increase the minimum wage to $15. They say this will really help folks improve the quality of their lives. You would think that it just might dawn on someone (Murphy or Sweeney?) that if business costs increase, that just maybe these increases might be passed along to the end user (Joe Taxpayer) so business can recover the increased cost of doing business. Hmmm – that sorta defeats the whole purpose of increasing the minimum wage. But hey, it was really good for getting votes Democrats. Hell, what do I know, I’m just an MBA…. My friends, these self serving (let’s hit that word 3X), inept and incompetent politicians never cease to amaze me. How the hell does a deficient for State pensions and benefits DOUBLE by $2 Billion from just 2020 to 2023? Magic? Magic math with budgets, that may be. The suggestion to raise the income tax by 25% and also jack up the sales tax and place this great burden on Joe Taxpayer is not solving the problem. Let me put this in terms a NJ politician will readily understand – Robbing Peter to pay Paul only works when Peter has money – what happens when Peter flees the State, for let’s say Florida, and you can’t rob Peter anymore? These socialist politicians will try to find a way to rob the money from somewhere, but sooner or later they will “hit the brick wall”. That’s when things start to get really nasty – There will be a day when taxpayers will start murmuring about cutting State pensions and benefits in order to mitigate the incredible cost burden on their backs. They know to well that the socialist Democratic politicians will try their old standby trick of raising taxes – this time through the roof. The last straw did break the camel’s back. Not fair to the State employees – not fair to the taxpayers – but, hey it got the socialist Democrats a lotta votes. Every way and anyway you look at it – there will be no Happy Ending for anyone when the manure hits the fan for the last time. Now, back to packing up my stuff for the move to Florida …..
Government knows nothing about running a business or controlling costs? They specialize in spending & creative revenue sources. Consider this minimum wage raise to $15 per hour, now calculate all the associated taxes that will be generated into State coffers. Revenue to subsidize more spending, not to reduce debt. In the meantime what are they doing to make NJ more conducive to nurturing small business? They’ll offer great tax subsidies to attract large businesses, those capable of affording the $15 minimum, but those business aren’t the major employee generators for NJ workers. As a small business owner who has experienced declining net profits via taxes, mandated fees, required comp & business insurances all getting added into actual sales generating costs, it gleams a bleak future with more small business sunsets than sunrises. I own Dunkin businesses. Government want to increase minimum wage $15. Can government reduce Workers comp rate, unemployment insurance rate. MURPHY’S LAW: If something can go wrong it will go wrong. If the thing is on-track and working properly, count on Phil to screw it up. The CEO’s core responsibility is survival of the enterprise. Implicit and right behind survival is profitability. Although increasing the Minimum Wage sounds so compassionate, it works against the very people it’s supposed to help. The free market is the best approach for retaining and attracting worthy employees. The City of Seattle raised the Minimum Wage to $15/hr in 2014. Result… jobs disappeared. When costs exceed acceptable levels, businesses will seek lower cost alternatives, methods and approaches to operate and perform repetitive tasks i.e. implementing technology. McDonald’s expanded their use of kiosks while reducing headcount; Banks embraced ATMs to replace tellers while also enhancing Customer convenience. There are countless examples. Most bureaucrats never had to make a payroll. Most are clueless to the day-to-day challenges of launching, running, growing and operating a business. Message to Trenton: Far too many have had enough. People are voting with their feet and moving out. They’re taking their assets, businesses and jobs with them. New Jersey ranks at or near the top of the that list. Murphy’s Law NJ is always last or near last in economics. This will not change. A sad place to live and work. Murphy is a communist rat fink. as a small business owner, this is a way to drive up our cost and send the work to Mexico and China. Not to smart. My New Jersey customer already sent 300 jobs to Mexico and is killing my business. The raising of the minimum wage is a political campaign ploy. It has nothing to do with reality of making NJ more affordable. With this increase this will happen: drive the small Mom & Pop outfits slowly out of business as they can’t afford to keep up with the pay raises. Employers will just cut hours and employees – think it is hard to find someone to help you know just wait. Who will an employee want to hire – someone with a brain who has at least a high school diploma or someone of lesser education who can not think? The problem is NJ is driving the educated middle class out of NJ due to higher prices and taxes – the retailer, whoever, they are will just raise their prices to ensure their profits above the wage increase: still think a sandwich in Wawa will be $5.00? Raising the minimum wage is all smoke and mirrors and does not address the real reasons NJ is becoming unaffordable to live in. Remember when the state income tax was 3%? “Since the day I was sworn in as Assembly Speaker, I have pledged to do all I can to make New Jersey more affordable. By increasing the minimum wage to $15 an hour by 2024 for the majority of workers we are achieving the goal of lifting people up to improve their quality of life,” said Speaker Coughlin. Economics 101: affordability has 2 components; income and expense. Increasing income without controlling expenses does not increase affordability. Government expenses go up so we have to pay people more money so they can pay those additional expenses which in turn increases other expenses. I was not aware it was the government’s job to lift people up to improve their quality of life. Maybe with less government regulation and spending people could lift themselves up. Life long resident of NJ and small business owner – I don’t want to have to leave to be able to retire! Soon the governor and his cronies will have almost everything they want..Theyhave sheep that will vote for anything free and now NJ is #1in people departures. Hmm, Soon they better look at who will pay for all these perks? 47 years as a small business owner, hiring high school and college students, I didn’t realize this part time job was supposed to give them a living wage. Did I say that they ALL still live at home.. Finally, Mr. Speaker, I believe you will be retiring with great benefits in health and wage income..BE REAL !! Its a dollar a year for the next five years. That seems like the regular cost of living increases raises I give out. The extra workers comp is bad. According to the proposal of wages going to $10.00/hour in July then to $11.00 on Jan 1, 2020 that is approximately an 24% increase in wages. Are these politicians completely out of their mind? They also did not factor in the increase in an employers contribution to taxes (approx 15%) additional on those increased wages. As a small business owner, how do they expect the owners to increase sales enough to compensate for this ridiculous increase in wages and continuing higher wages each year? If Trenton is going to reduce my tax burden by 24% (and that’s only the first year) then I would be in favor of higher wages. Find the money somewhere else. Many people have stated that a minimum wage earner is only starting their life as a contributing member to society. Minimum wage is not designed for people to raise families or start careers. It is simply a starting point that many businesses have factored into their budget. Most businesses will not be able to simply pass on the increase costs to their customers, and even if they could, their customers may be many of the new higher minimum wage earners who will simply give their higher wages back to the small business owners. Increasing the minimum wage will stifle new job growth, cause layoffs, decrease small business growth and on and on. How about someone revamping the state budget for health insurance and pensions for state workers and politicians. Why not take it from them? If small business owners have to give up income why shouldn’t politicians and state workers? Let’s pull the money from them and see how well that is received. NJ is already known as the armpit of the country so why do we want to make it worse. Taxes, taxes, taxes, businesses moving out, people moving out, no new businesses moving in. Trenton, you are doing a fine job! I can’t wait to sell my business and hopefully retire and get the heck out of dodge. This will also affect summer time jobs for high school students, internship programs through trade schools and colleges which are part of their education and included as tuition. 1. WaWa gas stations will have more orange cones up. 2. Foreign owned Gas stations that pay under the table will thrive. 3. Legal citizen owned gas stations will disappear. 4. Grocery prices will skyrocket. 5. More department stores will go under. 6. Fewer entry level summer jobs. 7. Prices will be cheaper in Delaware & PA (diverting shoppers). 8. More internet (out of state) sales. 9. People (including our self’s) will relocate out of state at retirement. All you “business” owners had better go stand in front of your employees and tell them they’re not worth a dollar per year. Tell them you wish you could pay them less but the government won’t let you. See how hard they work for you then. When politicians are making $165,000.00 plus medical and have never run a business how can they have any clue what this means. Lets pay politicians based on how small businesses perform. When they see small and medium business are losing everything then in turn they are making nothing since their paycheck is performances based we can see how their tune will change. Better yet have ALL politicians and policymakers go get their own medical insurance on an individual plan and even though now they will not be making much money, make sure they are not eligible for all the freebies they have us pay for when someone hardly makes anything and gets on some great subsidized plan. When they get paid directly based on the results of their policies well that would be the day.